This is a recently developed track which is quickly becoming one of New Zealand’s best. It has a unique combination of beach, bush and sub-alpine scenery, vintage viaducts, and the historic Port Craig area. 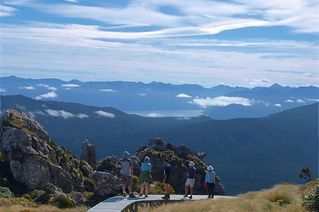 The Tuatapere Hump Ridge Track explores the southern boundary of Fiordland (part of the Te Wahipounamu South West New Zealand World Heritage Area). At almost 1000 metres, Okaka Lodge is the highest point on the track. Port Craig, at sea level offers walkers the chance to swim in the Southern Ocean. Experienced guides will share their knowledge as you hike wearing only a day pack. Cooked meals and a hot shower will greet you at the end of the day. You will stay in comfortable double or twin accommodation. Alternative options– There is the option of being helicopter-lifted between huts. (A plus for non-walking partners). This is charged on a per sector basis. Pre-departure – Your adventure begins with drinks and nibbles in Tuatapere, where you learn about the track and get to know your guide, before checking your accommodation. 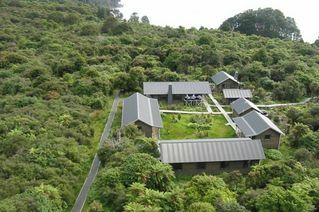 A scenic helicopter ride over Te Waewae Bay delivers you to the start of your walk. You will climb up to the top of the Hump Ridge, experiencing our beautiful bush first-hand, as it changes dramatically with elevation. As you head up to the top of the ridge to Stag Point, the trees part and you are welcomed once more to the beautiful bay – this time from a different perspective. 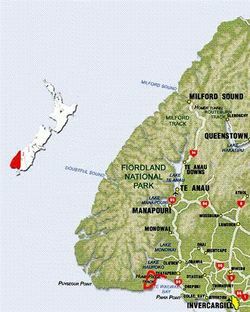 From here it is not far to the top of the ridge, from where on a good day you can see the islands off the south coast, and the nearby Fiordland lakes and mountains. When you arrive at Okaka, the “lodge on top of the world”, all you will have to do is unwind, as you admire the views, settle into your private room with super-king sized bed, and take a hot shower. You will feel at home with our lodge managers’ home-cooking and hospitality. 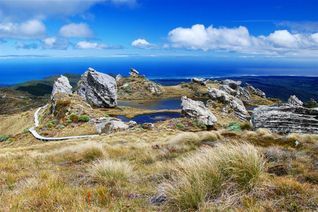 After breakfast you wander down the Hump Ridge, with 360 degree views of Te Waewae Bay, the south coast, Waituna terraces and the mountains behind them. While you are walking over the 3 mighty wooden viaducts on the way to Port Craig Village, consider the men who built them over a century ago. Our guide will share many stories from the days when Port Craig was a bustling sawmill town in the 1920s. If you are interested in the history and relics that surround Port Craig, choose to take the interpretive trail, or just meander down to the beach, and spy our resident Hector’s dolphins, who live at the old wharf poles in the surf. Awaiting you at the lodge, our friendly manager will welcome you to your room, and you can put your feet up, and once again enjoy their hospitality while taking in your new coastal backdrop. To complete the track, you will first walk out under native bush canopy, then along our beautiful golden beaches – one named “Blowholes” because of the ring of rocks the waves blow up through as they come to shore – a spectacular finish to a fantastic trip! Walk back along the section you flew over on day one, and enjoy it once again, but at beach level. Lodges are built from renewably sourced pine. Boardwalks have been made around ecologically sensitive/easily eroded parts of the track. Once a waste product, woodchips from native timber is also used on some parts of the track. Meals and snacks: 3 course meals and all lunches and snacks included, wine and beer available for purchase.